I’ve previously written about how the seasonal buildup and decline of the honey bee colony is a function of the birth and death rates of the workers . Varroa follows a similar buildup and decline pattern in its host colony (although those who keep bees where winters are short may not notice the decline part). In my quest to learn to better manage varroa, I realized that I needed to better understand the math of the mite, so I took a stab at modeling its numbers. In doing so, I discovered important implications for regional mite management, biotechnical methods, treatments, mechanisms for mite resistance, and the importance of each beekeeper’s responsibility to both the beekeeping community and the natural evolutionary process taking place in the bee population. The honey bee is enjoying its moment in the sun in the public’s eye, and many are taking a stab at beekeeping for the first time. This has been very good for those who sell merchandise to beekeepers, but not necessarily so good for the bees or existing beekeepers. Despite their admirable intentions to “save the bee,” due to their failure to manage varroa, many beginning beekeepers wind up flooding their local environment with mites when their colonies inevitably collapse. What I’ve found, however, is that when I explain varroa buildup to them in visual terms, that many finally get the picture (Fig. 1). Figure 1. Is it time for me to start treating for varroa? If you wait until you start to actually see mites on your bees, it’s typically already too late. Although some have suggested that this unfortunate bee would be a good poster child for the well-intentioned, but poorly-informed “treatment free” beekeepers , the actual reason for its burdensome mite load is of interest . Snarky humor aside, starry-eyed new or (sometimes intentionally) negligent beekeepers are making beekeeping difficult in many urban and suburban areas, due to “drift” of mites from their inadequately-managed colonies to those of their neighbors. As with a honey bee colony’s population, varroa population dynamics are a simple function of the birth rate vs. the death rate. The only place that varroa birth takes place is in sealed brood cells (either drone or worker). 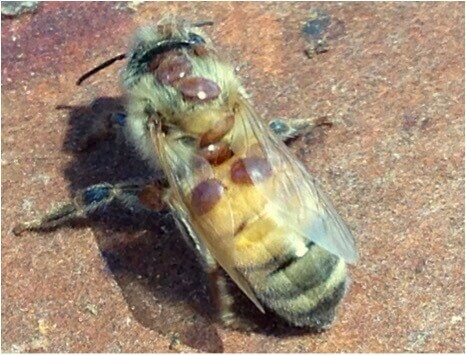 Varroa death comes from natural mortality , premature death due to VSH , from grooming and biting by the bees , and when a mite makes the mistake of riding on a bee that exits the hive for its last flight . The rate of decrease due to mortality and drift when the colony is broodless. Figure 2. Starting with a single mite, a colony that rears brood for only 5 months of the year would end up with 8 mites at the end of the year—a net 8-fold increase in mite level over the course of each year that would need to be reduced back to 1 for sustainable beekeeping. This extremely simplified model does not account for drift of mites from other hives (or any other factors—which I will address in an upcoming more complete model). Clearly, the beekeeper would need to reduce the mite level at some point. Splitting the colony would reduce it by half. The issuance of two strong swarms would bring the overall mite increase down to only 2x, thus helping to explain why high-latitude feral colonies may live for several years . Or a single miticide treatment that reduced the mite population by 85% would result in a sustainable varroa management program (Fig. 3). Figure 3. 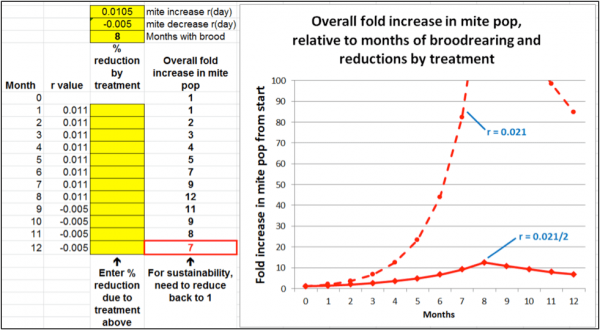 We can use this simple model to determine how many mite reductions (by whatever means) would be necessary for your region—dependent upon how many months the bees are seriously rearing brood. Note that I am intentionally using the term “reductions” rather than “treatments”—you could pick the mites off with tweezers if you wish, but a treatment (synthetic or organic) is far less time consuming. Practical application: northerly beekeepers have it easy—one or two decent mite treatments a season will completely control varroa (one reason why Canadian beekeepers are enjoying a lower colony loss rate than are U.S. beekeepers . Unfortunately, the success with their methods cannot be extrapolated to beekeeping at lower latitudes. 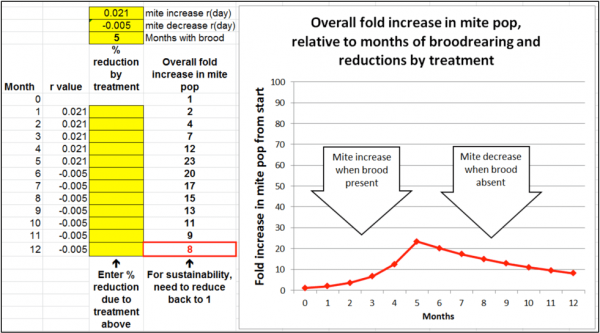 Most of us do not enjoy the luxury of only five months of broodrearing, and we’d unfortunately need to deal with a higher net annual increase in mite level in our hives. For example, in the UK, where bees do little foraging for at least three months during the winter, Al Toufailia  recorded 11-month increases in the range of 21-65x (average 45x). So what if we increase it to eight months (say, from the beginning of March through the end of October)? See Fig. 4. Figure 4. With 8 months of full-on broodrearing (in bee stock not bred for mite resistance), you’ll wind up with an expected 150-fold increase in mites at their peak, then winding down to 85-fold after late-season attrition , necessitating a more serious mite reduction strategy (Fig. 5). Figure 5. A single 99% efficacy treatment would do the trick, but you won’t obtain that degree of reduction with most treatments, so it will take two effective treatments (or other form of mite reduction) to be sustainable (because you’ve got to get back to 1). 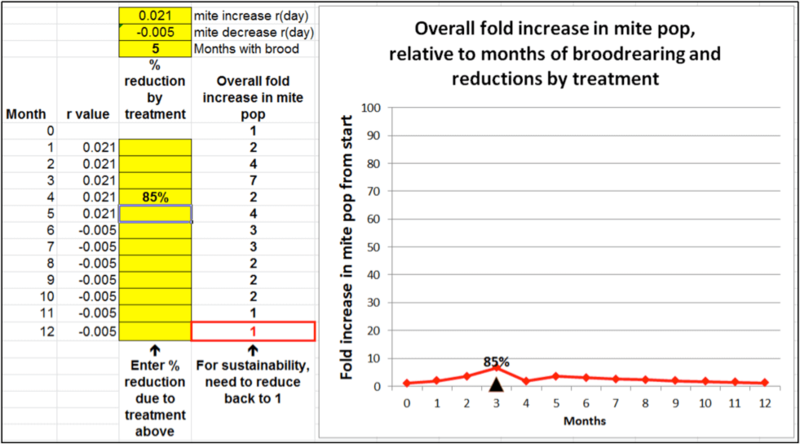 Practical note: when I started working with the logarithmic progression of mite buildup, to my surprise I found that as far as modeling, it makes no mathematical difference in the end-of-year mite count at which point during the year that a treatment is applied (so don’t worry about where the treatment arrows are applied in these graphs). Biologically, however, the mite level must be brought down prior to the mite infestation reaching a high level (~10-15 per 100 bees), or an in-hive DWV epidemic will result in that colony collapsing. 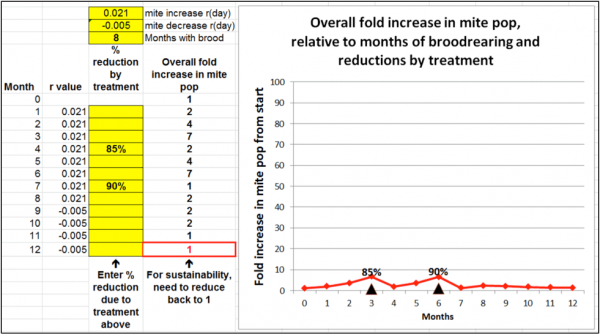 The bottom line is: reduce mite counts to the minimum in mid August if you want your colonies to survive the winter (you may need to follow up if you’re plagued by mite drift later from other hives in the season). OK, so how about us Southern and California beekeepers who live in varroa heaven? I’m not even going to show you the untreated graph, but we used to be able to get by with two treatments a season back when we got 98% efficacy (Fig. 6). Figure 6. 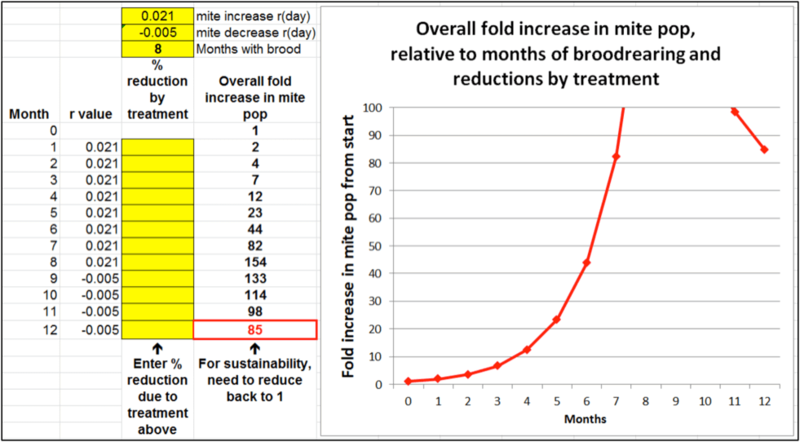 With eleven months of full broodrearing the mites can increase over a thousand fold (not shown). It would take two extremely high efficacy treatments per year to be sustainable. Unfortunately, repeated application of a high-efficacy treatment–without rotation–is the recipe for breeding mites resistant to that treatment. Many commercial beekeepers who have relied upon amitraz alone for many years are beginning to notice that it’s taking more than two treatments a season nowadays to keep varroa under control. We can use this simple model to figure out to what degree amitraz is losing its efficacy (Fig. 7). Figure 7. I know a number of beekeepers who are being forced to treat several times a season as amitraz shows signs of failure against their mites . At 75% efficacy, it takes 5 treatments to get back down to baseline. Unfortunately it’s not gonna get better if they keep doing the same thing. When a synthetic miticide begins to fail, what generally happens is that rather than switching to different miticides, beekeepers instead start ramping up the doses or repeating them more frequently—which then results in accelerating the evolution of completely resistant mites. Two recent studies help to explain why varroa is so successful at evolving resistance to synthetic miticides  (not to say that they can’t also become resistant to other treatments). It’s akin to playing against the house—the deck is stacked in favor of varroa, and we beekeepers are always the suckers, with the typical timing of our first treatment actually accelerating the evolution of resistance to that product. 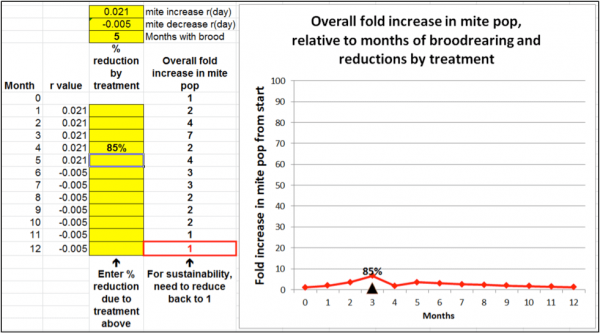 Practical note: something else that I found important to understand is that with the logarithmic progression of mite buildup, mite reductions are not additive—it takes six 50% kills to equal a single 98% reduction. Once a miticide’s efficacy drops to only 50%, it takes a lot of treatments to hold varroa in check (Fig. 8). Figure 8. 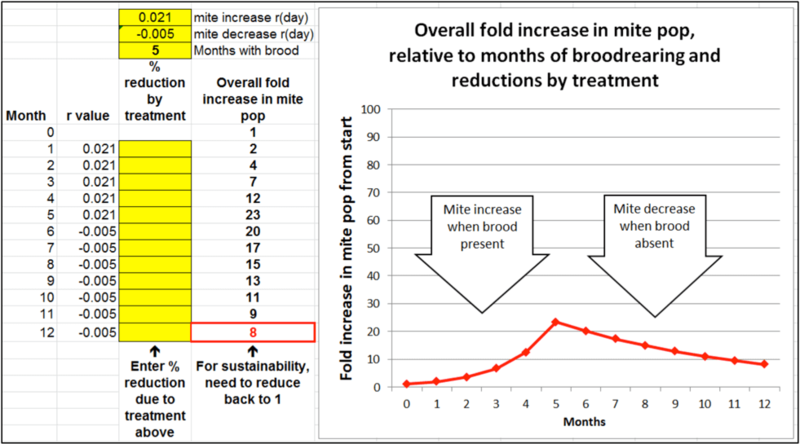 An important thing to keep in mind is that if the mite population doubles each month (as it does in much commercial bee stock), that you’d need to kill 50% of the mites every month of broodrearing to keep them from building up! Many beekeepers have been disappointed when they counted on low-efficacy treatments, such as sugar dusting, or oxalic dribble or vaporization when brood is present (at best a 50% kill). Ditto with improperly-applied treatments (cutting back on the number of strips, or not getting the treatment into the broodnest). Practical application: don’t just blindly trust that a treatment actually took care of varroa—check back after 2-3 weeks (to allow for mites to emerge from the brood) to make sure (alcohol wash is the easiest and most reliable assessment). Hand the fight over to the bees by breeding for mite resistance. It’s probably pretty clear that I’m personally doing both in my own operation . If we breed for bees that are even partially resistant to varroa, it would make a huge difference in the required amount of mite reduction per season. For example, let’s return to the graph for 8 months of broodrearing (in which the mite population increases to a peak of 154x the starting population, and finally settles back to 85x by the end of the year). This time we’ll run the same simulation, but with the r value for mite buildup halved (to 0.0105; holding the rate of mite mortality the same) (Fig. 9). Figure 9. If we ran bees that merely halved the rate of mite reproduction, the varroa population would increase in late summer to only 12 times its start, and eventually settle back to only 7x. And all it would take would be a single 80% mite reduction applied once per season (not shown) to be sustainable—easily attainable with a single oxalic dribble in fall. 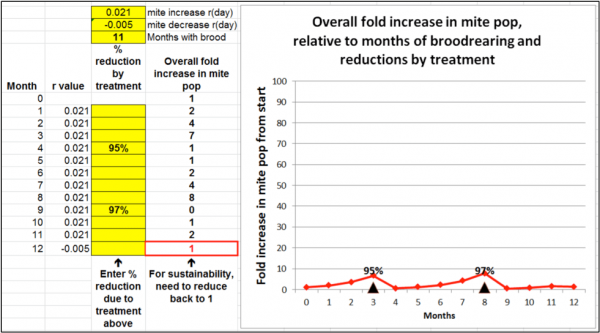 Practical application: it doesn’t take much reduction in the average number of fertile daughter mites per reproductive cycle to halve that rate. My point is that we don’t need to breed for 100% mite proof bees—beekeeping would be easy again if we ran bees that simply halved the rate of mite reproductive success. Thanks as always to Pete Borst, and to my ever-supportive wife Stephanie, who suffered through being a varroa-modeling widow this past year. See my Understanding Colony Buildup and Decline series at ScientificBeekeeping.com. Although I appreciate the good intentions of those embracing “treatment free,” it is being biologically naïve to think that withholding treatment from commercially-produced bees will result in anything but their inevitable and gruesome death. Unfortunately, “treatment free” has such an alluring feel-good ring to it (plus the fact that it absolves one of any responsibility for managing their mites) that many ill-informed beginners lose their first few hives to varroa/DWV collapse. That said, I myself am a treatment-free beekeeper, the difference being that I am engaged in a biologically-realistic selective breeding program involving a breeding pool of over 1000 colonies (it’s biologically unrealistic to think that one can make much progress in breeding for mite resistance with a small number of hives). I currently have over 100 colonies that haven’t yet required treatment this season to hold their mites in check. But I do treat any hive that doesn’t control its varroa level. I will replace the queens in my entire operation next season with the daughters of those colonies that exhibit actual mite resistance. There is no need to allow a colony to die in order to help with the evolution of mite-resistant bees. In truth, you’re unlikely to actually ever see a bee with this many mites. I took this photo while I was checking the efficacy of various formic acid treatments at killing mites in the brood, and had used a cappings fork to pull a bunch of pupae out of their cells, and then banged the frame on a hive cover to dislodge the remaining mites—leaving a pile of messy skewered pupae and mites baking in the sun. In this particular test, the treatment was unsuccessful at killing the mites in the brood, and I’d walked away for a few minutes. But when I returned to wipe the hive cover clean, I found that this young worker had been in the process of emergence, and managed to stand up uninjured. But every live mite for several inches in every direction had identified that poor bee by odor (mites are blind), and clambered (in the hot sun) over the dead pupae and their juices, and managed to climb onto this poor bee—showing just how well mites are able to locate a newly-emerged worker by smell alone. We don’t yet know much about the effect of pathogens (such as viruses) upon varroa. As a result of which all the immature, and perhaps also the foundress mite die. Kruitwagen, A, et al. (2017): Naturally selected honey bee (Apis mellifera) colonies resistant to Varroa destructor do not groom more intensively, Journal of Apicultural Research, DOI: 10.1080/00218839.2017.1329797. Aumeier, P, et al (2007) Should I stay or should I go? Infestation level of Varroa destructor and its impact on honey bee and mite population structure. Abstracts / Association of Institutes for Bee Research Seminar. Apidologie 38: 501. Seeley, TD (2017) Life-history traits of wild honey bee colonies living in forests around Ithaca, NY, USA. Apidologie DOI: 10.1007/s13592-017-0519-1 Open access. Leboeuf, A, et al (2017) Canadian Association of Professional Apiculturists Statement on Honey Bee Wintering Losses in Canada (2016). Al Toufailia,H, et al (2014) Towards integrated control of varroa: effect of variation in hygienic behaviour among honey bee colonies on mite population increase and deformed wing virus incidence, Journal of Apicultural Research 53(50: 555-562. The astute reader will notice that this number is somewhat higher than recorded by Al Toufailia. I suspect that broodrearing at Sussex (due to weather events during the spring and summer) is not continual. If all else has remained equal, this simple modeling suggests that amitraz is only about 3/4ths as effective (against their mites) as it used to be. This strongly suggests that their mites are developing resistance, which, based upon past experience, portends that it may become ineffective before long. González-Cabrera J, et al. (2016) Novel mutations in the voltage-gated sodium channel of pyrethroid-resistant Varroa destructor populations from the southeastern USA. PLoS ONE 11(5): e0155332. Beaurepaire, A, et al (2017) Seasonal cycle of inbreeding and recombination of the parasitic mite Varroa destructor in honeybee colonies and its implications for the selection of acaricide resistance. Infection, Genetics and Evolution 50: 49–54. Now Eric and Ian’s operation, with me just helping.